Happy Thanksgiving week from everyone here at Retro 1951. We are so thankful for you our fans! 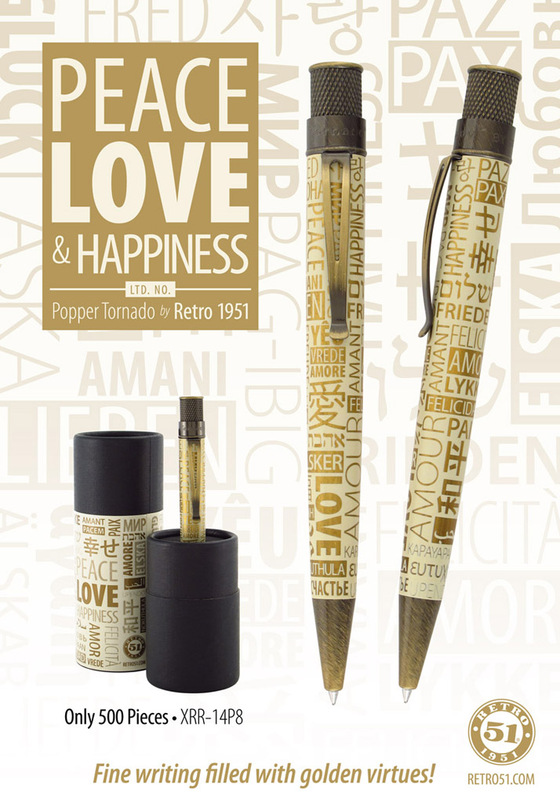 As a small way of saying ‘thanks’ we wanted to have a contest giving away a ‘Peace, Love & Happiness’ limited edition Popper Tornado to you AND a person of your choosing. All you have to do is comment and say who you are thankful for (first name and your relationship with them, for example, Bob – Dad). First thing Monday morning, Dec. 1st, we will have a random drawing and give you and the person you have mentioned each a Tornado pictured above. One entry per person. Contest entry ends at midnight Sunday November 30th, 2104. Scott – Michael W. & Mike G.
I’m grateful for my husband Paul, because he is without a doubt the best thing that’s ever happened to me! I am thankful for my wonderful wife who always makes time for me with her busy schedule and all she does for others. This Thanksgiving I am especially thankful for my loving, supportive family who have been there for me through thick and thin. I am thankful for my brother, Jimmy. He is my best friend, is always encouraging, and has selflessly accepted the challenge of taking care of my aging mother and step-father. Haha, we understood Matt. Thanks for clarifying. I am very thankful for my wife and best friend, Jennifer. Dave Thomas – Founder of Wendy’s! I’m thankful for Julie, my wonderful bride. Dave, you won! We emailed you at your hotmail account. Congratulations! My wife Gloria gives me peace love and happiness, she saved my life, for which I am very thankful. My name is Bob and , lately, I’m really thankful for my dad. I am not sure I am still on earth in that year!! Haha, I guess we will have to wait another 80+ years for the winner to be announced. My ninety-six year old father Sam. I love him very much! I’m thankful for my sister Debbie who also share a love for all things “pen” and especially her favorite Retro 51!